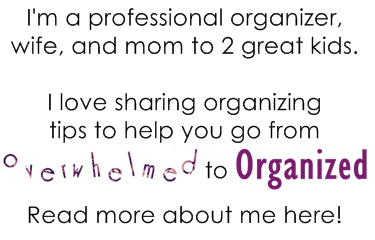 Do you feel overwhelmed during the month of December with all the stuff that enters your home? It makes it hard to enjoy this otherwise wonderful time of year. I've found that when I declutter throughout the month it really helps me feel less overwhelmed and I can enjoy Christmas much more. Will you join the Net Zero Decluttering Challenge this year? Each week I'll share decluttering tips and ideas to help you declutter a different area of your home. If you do that, you can end the month with the same number of items in your home (or maybe even less!) than what you started the month with. Today I'll share how the challenge will work and I'll share tips for decluttering holiday items. By the way, I did this challenge last year and I posted daily tips and decluttering ideas. If you'd like more than the weekly posts I'll be publishing this year, you can check out last year's #NetZeroClutter series here. Do you tend to notice your clutter more in December than any other time of year? Most of us do! Does any of this sound familiar? We just want to enjoy our homes with our friends and family during the holidays so it's extra frustrating when we're also dealing with clutter. I know for me personally, after decluttering for the last several years, I've definitely noticed I'm not as overwhelmed as I was when we had much more clutter in our home. And even though December is a busy month, decluttering has become a stress reliever for me so I especially feel better when I spend some time decluttering in December! So... 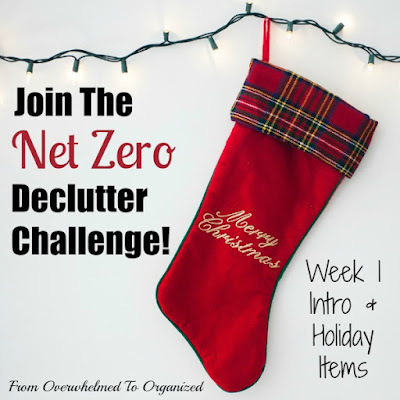 I started the Net Zero Clutter challenge last year and many of you also enjoyed that lighter feeling last December! 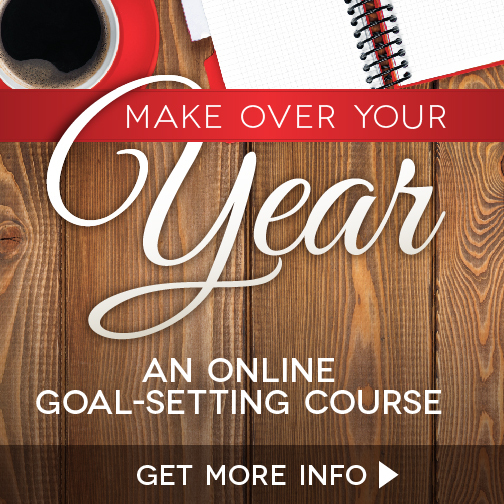 Are you ready to join in and feel less overwhelmed this year?! You can declutter anything you want to during this challenge! I'll give ideas, but just like in the 365 Items in 365 Days challenge you can declutter whatever you want whenever you want. But I know some people like ideas, so each Monday, I'll pick an area of our home and I'll share some tips to help you declutter that area. You can see the whole list in the picture below. Hopefully these ideas and tips will help you end the month with the same number of items in your home (or maybe even less!) than what you started the month with. Here's my plan for the challenge (but again... feel free to declutter anything you want... whatever will help you feel less overwhelmed this month!). Did I mention, you can declutter anything you want this month?! You don't have to follow this plan. 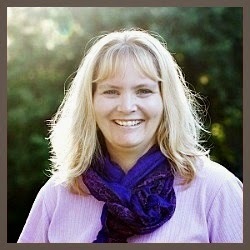 Or you can change up the plan to better fit your home, your available time, and most importantly your clutter. In order to know if you're reaching Net Zero, you need to keep track. To help you do that, I've created a tracking printable for you! Fill it in as you declutter and as items enter your home so you can see your status. Just click on the image below to download your own copy. Most of the items will enter our homes near the end of December so I'd recommend doing more decluttering in the early part of the month to compensate for that. Estimate how many gifts your family will receive this month and any other items you anticipate will be entering your home this month. Print out your free printable tracking sheet so you can track the items coming and going from your home this month. Join our 365 Items in 365 Days Facebook group as you do this challenge! You'll be able to share with others what you're decluttering and feel encouraged and inspired by everyone else who is also decluttering! This is a short week since it's already Thursday and I'll be sharing a new area of our homes on Monday, but I wanted you to be able to jump right in and start decluttering. So, for the next few days, go through your holiday items. Declutter anything you're not using this year. Decorations - indoor, outdoor, tree, etc. Lights - indoor, outdoor, tree, candles, etc. Holiday wrap - rolls, flat wrap, gift bags, gift boxes, tissue paper, tags, ribbon, bows, etc. Cards - old ones you've received over the years, extra cards you never sent and won't be sending this year, etc. Now is the perfect time to declutter your holiday items because you have everything out and you can see what you're using and what you're not using. Throughout this challenge I'll share my progress decluttering and I'll be tracking what comes in our home this month. It really was eye-opening for me last year and I'm sure I'll be surprised again this year. My estimate of items entering our home this month is 250. So my goal is to declutter at least 250 items. By the way, for items coming in, I'm not counting gifts we're buying this month that we'll be giving away in a few weeks. I'm also not counting gifts we're giving to people outside our home as items out. You can count them as they come in and as they go out if you'd like, but I'm not going to bother. I will count gifts we're giving our kids and that my hubby and I give to each other (when they are given) since those items will be staying. Oh, and I decided last year not to count consumable items that were given to us or that we gave our kids or each other, since they won't actually be staying long term. So as of now I'm at 0 items in/out, with a goal of decluttering 250 items in December. Take some time this week to declutter your holiday items. Or anything you'd like to declutter! Take some pictures and share your progress on social media using the hashtag #NetZeroClutter. Let me know how you're doing in the challenge so I can cheer you on! Sign up to receive my blog posts by email so you get each week's post in your email inbox. You can unsubscribe after the challenge is over if you don't want to continue receiving my blog posts by email. So that's this week's post in the Net Zero Decluttering Challenge! 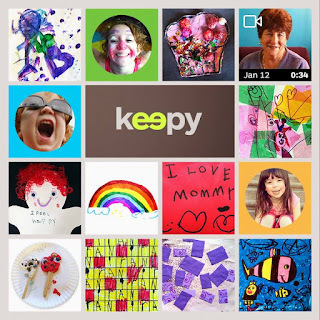 I'll be back on Monday with tips and ideas for decluttering kids' items. 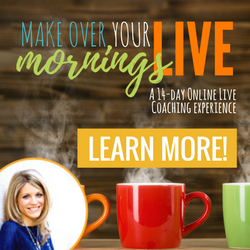 I'm excited to have you join me! 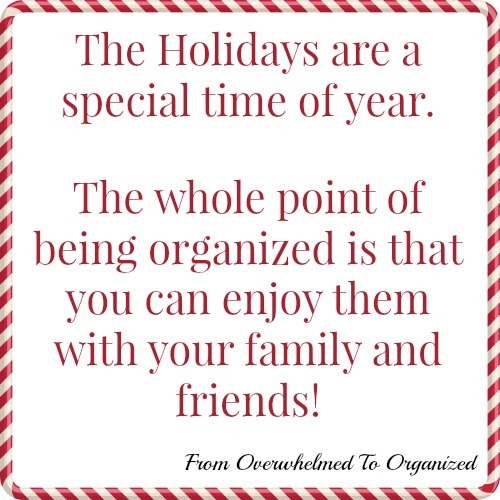 I look forward to hearing all the stories of how much more you're enjoying your holidays because you're not overwhelmed by all the stuff in your home! What is your estimate for items entering your home this month? How did you calculate it? What's your motivation for decluttering in December? This is a great idea! I always declutter in the fall just before the holidays and birthdays (I have two children with birthdays in October and November). I love making room for the new stuff they'll get by decluttering their rooms a few weeks into the fall. Although your post has inspired me to begin decluttering again, especially with my Christmas stuff! I've got way too much of it! I personally think Fall is a great time to declutter Deana... especially when birthdays fall in those months before Christmas. I hope you were able to find lots of Christmas items to let go of! I love your decluttering ideas. Although I usually feel that I lead a fairly minimalistic life, there is still a lot of junk that piles up, and then we have no room to store the things that are useful and necessary. The main task this week, I think, is to go through my girls' bedroom. With kids I find it doesn't matter how minimalist we try to live, we have to stay on top of incoming stuff so that it doesn't accumulate. Hope you were able to declutter items from your girls' room!